My babies aren’t babies anymore, but I still love to share products with you from brands that we know, love, and trust. Earth’s Best is one of them. Earth’s Best is celebrating a special milestone in 2010—its 25th birthday! Founded in 1985, Earth’s Best was started with a simple “wish” – to keep potentially harmful pesticides out of the earth and children’s food supply. For 25 years, Earth’s Best has realized that “wish” and has provided millions of babies with pure, simple, organic foods to grow up on. The line has even expanded to also include organic infant formula, diapers, wipes, baby body care and home cleaning products made with organic ingredients, making it the gold standard for parents who seek products that are better for their babies and for the environment. We all understand how important birthdays are, and Earth’s Best is particularly excited to commemorate this milestone. To celebrate, Earth’s Best is inviting parents and grandparents to share their own wishes for their baby’s future at www.earthsbest.com. As we enter a new decade, Earth’s Best wants to hear about the hopes and dreams parents have for the next generation. These wishes will be shared with the online community and entered into a sweepstakes where one lucky child will win a $25,000 savings bond from Earth’s Best. To enter the Earth’s Best Birthday Wishes sweepstakes, visit Earth’s Best before March 31st, register, and submit a wish for your child. 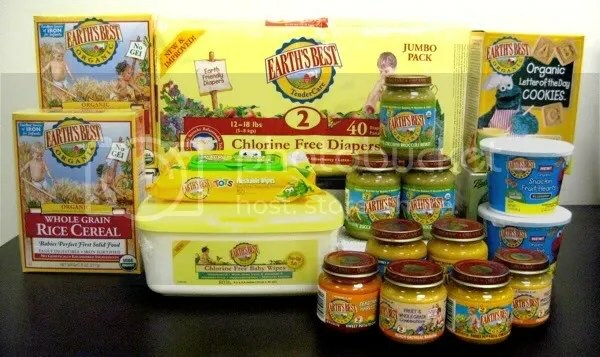 As a thank you for taking the time to learn about this promotion, Earth’s Best would like to award one of my readers with a prize pack filled with an assortment of Earth’s Best products, including diapers, wipes, baby food, cereal, cookies and more! Pictured below, it’s a prize valued at approximately $50. To enter to win this prize package, please leave a comment below with one wish you have for your child/children/grandchildren. Contest ends: February 7th, 2010 11:59 pm EST. US entries only. One person per household may enter. Leave a separate comment for each entry & a valid email address. Winner, chosen at random, has 3 days to claim their prize. Prize package and information above all provided by Earth’s Best. One wish I have is for my children to enjoy helping others. Oh wow, what a FABULOUS prize pack!!!! My wish for my son is for him o get out of diapers before he turns 4!!!! At this rate, his baby sister will be potty trained before he is! .-= Tiffany´s last blog ..Seventeen Years Ago Today… =-. I hope that my children have a life filled with joy and no regrets! And whatever they set their minds to that they accomplish it. I wish my children will learn to have great patience and discernment. thanks for the chance. This is the wish I created on the Earth’s Best site. My wish for my daughters are to be healthy. .-= luvtosave´s last blog ..Wordless Wednesday: A finger to hold =-. I have a wish that my children will be kind to humans, to animals, everyone/thing they encounter. So many kids today are just plain uncaring when it comes to how they treat other people. I hope I can teach mine to value all people. I wish for GOD to order their steps, watch over them,and protect them. I wish that my children will all find spouses as wonderful as mine. One wish that I have for my grandchildren is that they grow up with confidence to become whatever they set their mind to become but that they also have empathy for others. I hope that wise saying, “Youth is wasted on the young” be less true in my daughter’s lives. One wish I have for my children is that they grow up to be kind, loving and unselfish. Thank you for the chance to win. To live in a world free of hate! I have only one wish- to see my granddaughter in person- she’s now age four. I wish for my kids to be suceessful, happy and healthy. One wish I have for my daughter is that she will marry a kind and loving man some day. I follow you on twitter and tweeted about this giveaway. Thanks! I wish for my little girl to have a great life full of love and become a wonderful person who makes a difference. My wish for both of my children is that they will accept Jesus into their hearts! I wish they will learn to really love and enjoy their siblings. To have a happy, fulfilling life, even if their definition of that differs from mine. My wish is that all of the kids will have good morals and work ethics! My simple wish is that they be happy and good. I wish that they have a good life that is lived to the fullest. I wish my children could grow up in a world without wars. .-= Nadine L´s last blog ..Win a Rival 5 Qt. Programmable Crock Pot =-. My wish is for my children to be happy and healthy. My wish is for my kids to be healthy and happy in whatever they do. I wish my nephew has a healthy, happy life! .-= Chrysa´s last blog ..Healthy Style Sesame Chicken – Lower Fat and Lower Calorie =-. I wish my baby will reach all his goals and his potential throughout life. My best friend just had a baby 3 weeks ago!! great gift! I wish my son always have happy days! My wish is for them to be happy and healthy. I wish my daughter grows up healthy and happy! To be happy, succesful, and always loved. I just wish success for my boys! .-= Jaime DeVries´s last blog ..Giveaways going on! =-. I wish my kids will be happy. I REALLY wish they will be healthy and none of them will die early because I already lost my daughter when she was 21. Thanks for this giveaway! This would wonderful for my new granson, Raineer. My wish is for my son to grow up and be the soccer player that he wishes to be! I know he can do it! I wish for my kids to have roots and wings. I wish for a healthy and happy life and I subscribe on facebook. Thanks for the entry!!! I wish for them to find a love that lasts a lifetime. I wish for them to be happy doing whatever they choose to do. That they will not have cancer and happily grow old! For her to be happy in all that she does in life. My wish is for my daughter to be happy and follow her dreams. My wish for my kids is that they learn to be patient- I’m still trying to figure that out. I just want my daughter to live a happy and fruitful life….tooo corney? I want my grandson to live a happy, healthy, productive life. The best possible food is an important part of that. I wish for my daughter to be healthy, happy, and know she is loved. I want my little girl to grow happy, healthy and very secure. I wish for them to be happy and healthy! I have a wish for my children to grow up without wars, debt, or natural disasters having a huge impact on their lives. .-= Larry Harms (cakeblast)´s last blog ..Funny Foto Friday XlX =-. A happy faith filled life. I have so many wishes for my children, but one that they my oldest would grow out of his food allergies and my youngest not develop them. I just wish for their happiness too! I wish for my children to have all the love and support they need. That they will turn to each other as friends when they’re older.